Department of Art | “Ancient Paths-Modern Visions” Call for Artists! Home » “Ancient Paths-Modern Visions” Call for Artists! “Ancient Paths-Modern Visions” Call for Artists! CALL FOR ARTISTS! 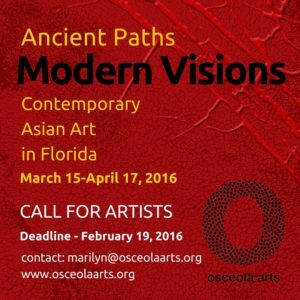 Osceola Arts will be presenting “Ancient Paths-Modern Visions” to be held in March at Osceola Arts in Kissimmee. Open to Florida residents of Asian heritage. All mediums will be accepted, including fiber arts and the decorative arts. The work can be traditional, representational, abstract or non-objective. This will be a multicultural and multi-level exhibition. Emerging and professional artists will be showcased. There is no fee for submitting work for this exhibit. Osceola Arts will not take commission on works for sale. Contact Marilyn Cortes-Lovato, Director of Visual Arts at marilyn@osceolaarts.org.